I cannot tell you when the last time I rocked myself to sleep. I do remember the smell of Alabama summer thunderstorms–ozone, Zoyzia grass and wet sidewalks, the faint hint of sulfur if Jackson Steel was pouring out on first avenue. Summer storms after dinner, four of us on the “glider”–a metal seat on metal straps hung from a frame. In the same exact point of the arc of swing, a clunk here, a faint squeak there, time after time after time. The back and forth, the warm laps, the soft summer night–how could two small boys have stayed awake? We must have been about 4 and 2, him headed north, me south; his head in momma’s lap, mine in Granny Bea’s. Lightning far off, no thunder; lightning bugs blink faintly yellow-green in the dark on the metal screen, squeak-clunk-pause, squeak-clunk-pause. And I was rocked gently off to sleep already in my jammies. We have a porch swing for less than a week now. Better than that, a friend made it and helped me hang it. And he wood-burned a remarkable image of our house into the back of it. 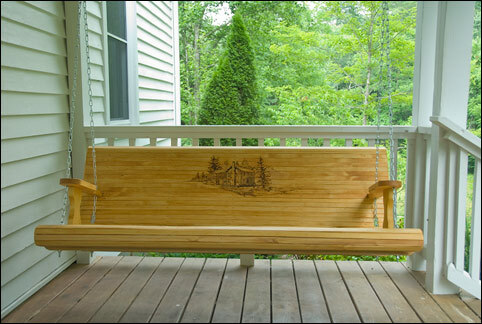 How I wish we had a covered porch big enough to have a porch swing on! I have very pleasant memories of long summer afternoons in my Aunt Anne’s porch swing, reading or just watching the world go by. Might have napped some, too — don’t recall. And are you talking about Birmingham, Alabama? I was born and reared there. I have indelible memories of riding down First Avenue in the back seat, holding my breath as we went over the viaduct so I wouldn’t have to smell the umm… flatus-like odor of the steel mills! Wow! A work of art that’s also a wonderful way to relax and enjoy the scenery!